In Australian English a number of terms derive from an association with place names. 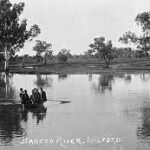 The Barcoo River in Western Queensland gave its name to a number of terms which became associated with outback life in the 19th and early 20th centuries. They include Barcoo rot, Barcoo sickness, Barcoo spews, Barcoo dog, and Barcoo shout.